This post was written by Sales Bootcamp’s Ashleigh Early. Follow her on Twitter here. Curling may not seem a likely inspiration for sales wisdom however after two decades following Olympic curling and with the recent #miraCURLonIce Gold Medal for the US Men’s team I was struck how many parallels I drew between my life as a salesperson and my sports obsession. If anyone is interested in joining me I’ll be in “Lean to Curl” classes this spring! If you’re new/unfamiliar with curling I suggest checking out this delightful two minute overview! You get points for being closest to perfection – not for second place. Points are earned by placing as many rocks between your competitors closest rock and the target. Even if you have all 8 rocks in the “house” but your competition has the one closest to the center you score no points. Sales faces the same challenge – identify what the clients needs truly are. The solution that is perceived to be closest to that ideal state will win 9 times out of 10. Every “skip” needs a strong third/”Vice-Skip” to confirm and correct the line. Throughout your career it’s essential to surround yourself with people who will tell you when you’re out of line. Whether it’s a tactic, a career decision or even a sanity check – make sure you have people who will call out when you’re potentially making a mistake. Sometimes the best move is to “blank” the end, but retain control of the game. In curling the last stone thrown in each end is called the “hammer” and is a key strategic advantage. The hammer stays with the team who scored most recently. Accordingly there are cases where the best move is to knock all stones out of the house so no one scores and you can maintain the hammer for the next end when it may be a larger advantage. Don’t be afraid to concede minor points – control of the conversation is what matters! Don’t forget to laugh – it’s a game! One of my favorite things about watching curling is seeing the teams laugh at themselves and their performance during the game. This pressure release valve keeps the teams cohesive and performing their best at all times. Sales is stressful – and we all do insane things to make sure our objectives are met. Never forget to get a good laugh in each day. You never know what the next “end” will bring. It could be a double for you, or for your opponent. Never assume success! I’ve lost count of the number of deals, meetings, projects that dissolved at the last second due to an unforeseen circumstance. Until the ink is dry vigilance is demanded. You can discuss strategy in front of opponents – it’s your strategy. Don’t let your competition change what you know you need to do to win. It’s common to very obviously indicate what shot you’re going to throw and discuss what the possible reactions may be from the opposing team directly in front of the competition. At first this was jarring – until I realized no team knows their competition as well as they know themselves. You must always play to YOUR strengths and weaknesses. Everything’s better with a cheering section! The South Korean Women’s curling team was a sensation in the Olympics – and their supporters showed up in droves cheering for every throw. Even when the result was a mistake. This enthusiasm is contagious – even though the spectators were new to the sport and didn’t understand what was happening they made sure their team knew every single stone they were supported. Our friends and family don’t see a large part of our lives – but hearing a statement of support from my support system (despite having no idea what I’m selling) can renew my spirit and keep me going even after a mistake. Use the best tools for you – regardless of what they look like. Vice-Skip Tyler George sported some…unusual…footwear during the games. A pair of shoes he’s worn for every game and practice since he took up the sport. Even the New York Times offered to buy him a better pair. The fact of the matter is – Tyler was one of the best shots throughout the tournament. If those shoes helped him to be that good – they did their job. Stay compliant, stay functional and fulfill your requirements to do your job. Beyond that use the tools you need to do your job. When you miss a shot don’t forget to analyze what the ice is doing right now. The playing surface will change throughout the game and you need to observe and adjust. In sales the situation can change hour to hour. When something shifts – rather that jumping inward “Man how did I blow that!” – look at the playing surface. Did a key stakeholder change their mind? Did a competitor enter the arena? Did the company over/under perform leading to budget shifts? Observe – then react. Friendship matters – there are no secrets when you see the same people over and over again! I tell new hires all the time you never want to seriously piss off anyone if you can avoid it. The world is too small and word will spread. The competitors you are up against in this deal will likely be in the next one, and the prospects you’re cold calling today will be the VPs and CIOs you’re selling to in 5 years. Always be polite, direct and conduct yourself with integrity. Have a SIMPLE process established early to handle disagreements with clients and competition. In curling the two skips agree which rock is closest. If they disagree there is a tool to quickly and accurately determine which stone is closer to the button. In sales the same process can be established through early identification of success criteria via discovery. Beyond an RFP these criteria should encompass the nice and need to have items as well as intangibles. Every team will make mistakes – the winner capitalized on their opponents mistakes better. All too often in life you will make mistakes – it’s okay! What maintains balance is everyone makes them – which means even if you blow a shot there’s a good chance your opposition will too. As a result one of the key factors in determining an outcome is who can turn their opponents mistake to their own advantage. Know when to step away for a break. Things usually look better when you come back refreshed. Those of us who can’t stand losing (or thinking we may lose) can fall into the trap of pushing too hard or doing too much which frequently can have the inverse effect desired. You just had a rough call? Grab coffee with a colleague – talk about another project. Everything possible went wrong this quarter? Do a weekend staycation! Taking that time to breathe means you can better see what’s working and what isn’t. The entire team must communicate and listen at every stage. While a skip will call shots, they also solicit feedback, and strategize with everyone else on the team. Frequently the shooter and skip were shouting to the sweepers to ensure the lines matched – meaning you had two individuals directing simultaneously, without contradicting, while two others listened and executed perfectly while exercising their own judgement. Not easy by any stretch! Never forget the basics! Even skips need to sweep. 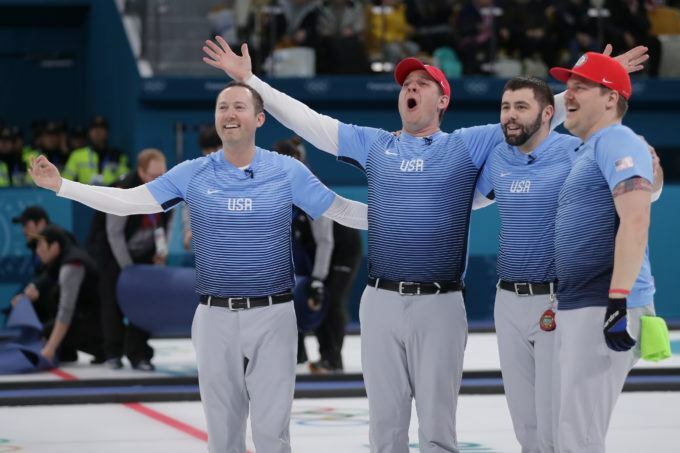 During one of the final ends of the men’s gold medal match the US Skip had to “sweep” a rock for (I believe) the first time in the tournament. Never let your core skills get too rusty. Don’t overthink – if you’re presented with an opportunity to score trust your skills and take the shot. You know what you’re capable of – if you see an opportunity to execute a kill shot don’t hesitate or over-think – finish it. In those situations hesitation is your worst enemy and will only errode your confidence – pick up the phone and do your job. You know what you’re doing – you trained for this! Acknowledge your wins – and what they mean to those around you. One of the most powerful moments whenever someone wins a medal is their reunion with family. These people loved and supported you when you were down – picked you up and fought with you. You may have the medal – but your win is their payoff moment too. Let them enjoy it and invite them to share in your joy with you! Find the leader you (and your team) deserve. This is my biggest piece of career advice – the right boss will make or break your career. When you are looking at joining any team your success is largely dependent on you leadership team. I encourage candidates to vet me as much as I’m vetting them (and I provide management references). I constantly work to be the leader my team deserves – and remind myself they chose to work for me as much as I chose to hire them. That pressure that is never far from my mind and pushes me to give everything I have for them every day.